So you've got your first (or second, third, twentieth...) draft of your book completed and now need to polish it to perfection. It's a daunting task, and you might not know where to start or how to do it effectively. After all, completing the starting draft was hard enough! If this sounds like you then you should have been with us at the DAZ in Stuttgart on October 15th. 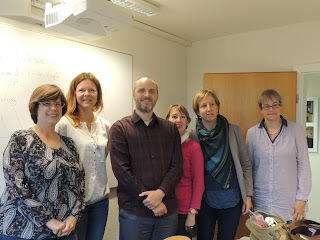 Author Dan Wells graciously agreed to give a free workshop on finishing your work. Thank you, Dan! And also a big thank you goes out to Lindsey Cole who organize the event for us. Twelve attendees, both SCBWI members and non-members, learned helpful finishing techniques as Dan shared his own method with us. Having published eleven books to date, Dan has developed an effective step-by-step plan to go from starting draft to finished manuscript. Great point. But, of course, getting from the “what” to the “how” takes a lot of time, revision, and editing. To make the process easier, Dan broke everything down into three phases: wide angle, close up, and polishing. Each of those phases has several steps which include tasks such as evaluating your first page, foreshadowing, chapter breaks, emotional pull, ensuring a satisfying ending, line edits, and much more. I won't list everything here but will tell you that his method is very thorough. As a picture book writer who is just venturing out into the world of middle grade and young adult fiction, I found it very helpful. During a question and answer session, further writing topics were discussed. These topics included anything from writing groups to agents. We also asked about the recently released film of his first book in the John Cleaver series, I am Not a Serial Killer, and about his new book Bluescreen. Thank you Dan for a wonderful workshop and an enjoyable day. There is also a Writing Excuses Retreat which takes place on a cruise ship, and in 2017 it will be coming to Europe. Tentative dates are July 30th-August 5th. 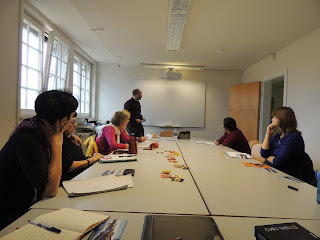 Keep an eye out on the Writing Excuses event page if you are interested in writing and learning while cruising in the Baltic Sea. One of my favorite things about being the regional advisor of SCBWI is announcing new books made by our members. Today we'd like to feature the coloring book REMEMBERING THE LADIES: From Patriots in Petticoats to Presidential Candidates. "Remembering the Ladies: From Patriots in Petticoats to Presidential Candidates"
Aarti Arora, Aditi Tandon, Aileen Wu, Arlene Holmes, Barbara Schneider, Caroline Mack, Caroline Yorke, Crina Magalio, Diana Patton, Holly Bess Kincaid, Jasmine Florentine, Jen Wistuba, Jill Obrig, Jill Schmidt, Jody Flegal, Judy Hnat, Julie Goetz, Justine Turnbull, Kat Schroeder, Kim Defibaugh, Kim Wood, Laura Leigh Myers, Laura Davidson, Lena Shiffman, Leslie Simon, Lynnor Bontigao, Mariya Kovalyov, Mary Delaney Connelly, Monisha Kulkarni, Natalie Obedos, Rachel Wintemberg, Sheryl Depp, Tiffany Castle, Tish Wells, and Victoria Ford. Carol Simon Levin is a Youth Services Librarian, author, storyteller and program presenter based in Bridgewater, New Jersey. Whether she is impersonating the woman who helped to build the Brooklyn Bridge, telling the amazing stories of early women in aviation, engaging families in a rousing Halloween Hootenanny of songs and stories, expanding on the mathematical and artistic possibilities of a simple square, or sharing the story of a dolphin who learned to swim with an artificial tail (along with activities to help children understand what it is like to live with a disability), she always strives to create exciting programs that engage her audience’s interests and expand their horizons. She is happy to bring her presentations to libraries, senior centers, historical societies, schools, camps and other venues. 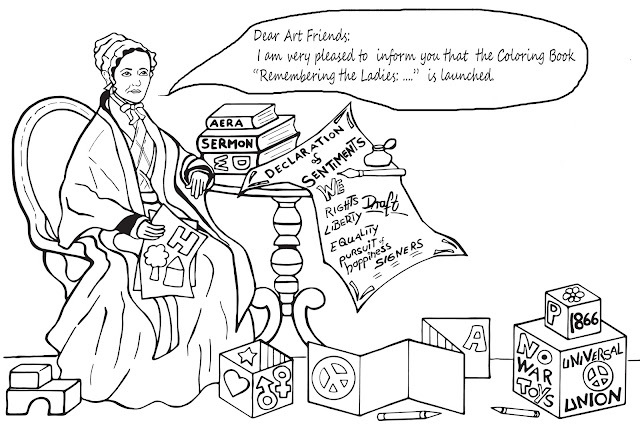 She has always been particularly fascinated by the history of technology and women’s history. Visit or tellingherstories.com facebook.com/TellingHerStories for more information on her books and presentations. Additional programs and resources for children and teachers can be found at: carolsimonlevin.blogspot.com. 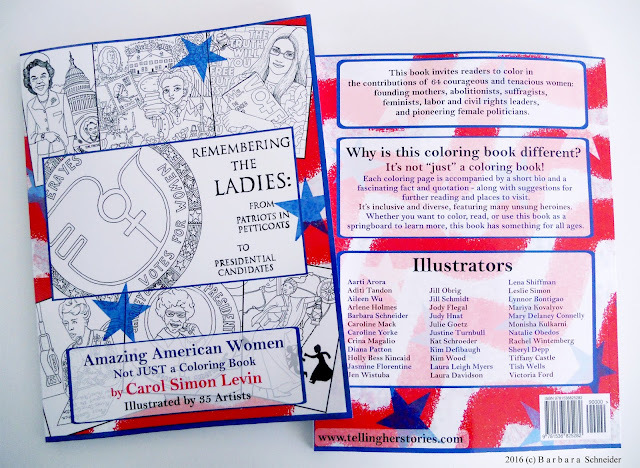 Carol Simon Levin is a member of the New Jersey Library Association, the New Jersey Storytelling Guild, and the Society of Children’s Book Writers and Illustrators. 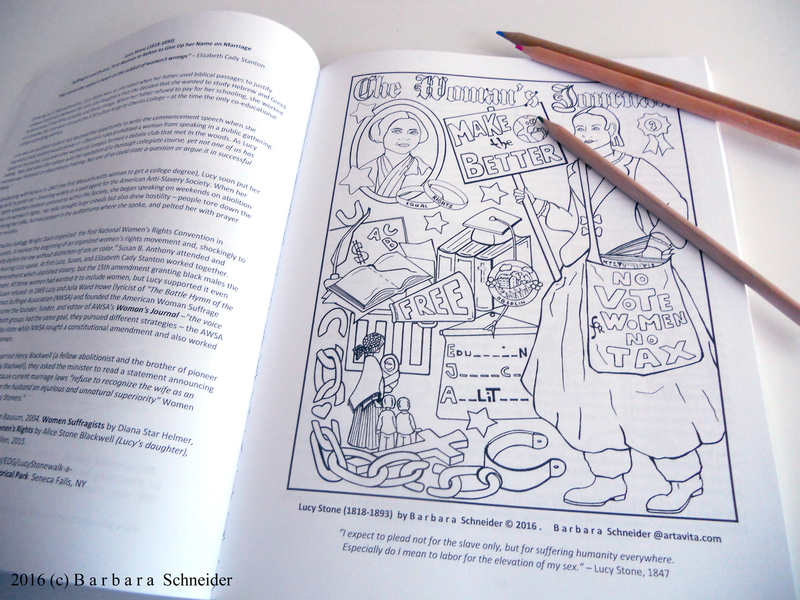 Coloring Pages "Lucretia Mott (1793- 1880)"
and "Lucy Stone (1818- 1893)" are illustrated by B a r b a r a.
Congratulations to Barbara and to all the other contributors to this wonderful project.